“How can Batman protect the future of Gotham City? Though it may be aimed at a younger audience than my usual faire, I keep finding myself called back to Imaginext. It’s one of the more expansive styles out there. Above all, they have easily one of the best collections of DC characters on the market right now, covering all sorts of different eras and corners of the universe. One of the more recent additions is a fairly popular character who doesn’t have quite the toy coverage you might expect, Terry McGuinness, aka Batman Beyond! 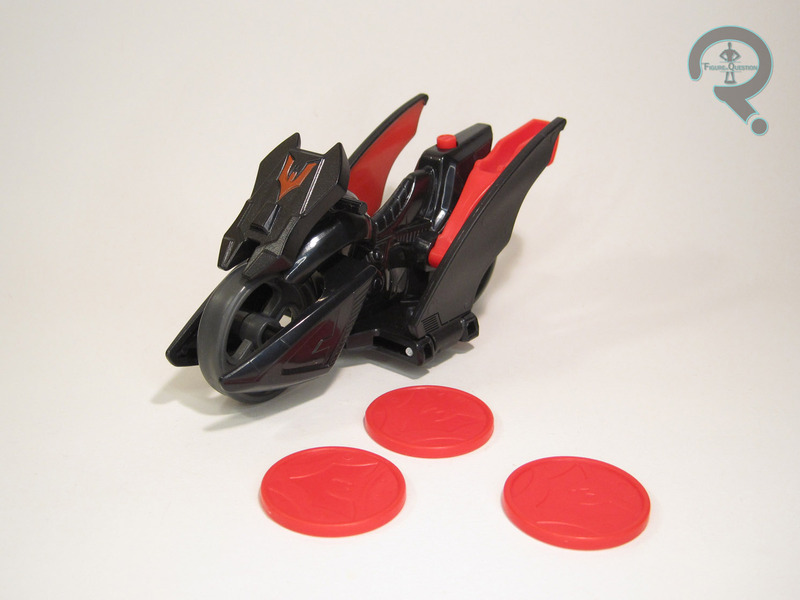 Batman Beyond is one of the “figure and vehicle” offerings from Imaginext’s DC Super Friends line, and he started arriving at retail late last year. The figure stands about 3 inches tall and has 8 points of articulation (with the legs moving as one, just like they always do). Terry is built on the basic Batman body for this line, which isn’t perhaps the most accurate, but Imaginext is known to tweak some designs ever so slightly. All it really means is that he’s got some more piping and texturing on his costume than he usual does, and given Terry’s future-setting, it’s not an unreasonable look. Plus, this way, he still has the glove scallops and utility belt. The rest of the work is paint, or lack there of. He’s molded in all black, which is sensible, and helps to downplay all that extra sculpted detailing. The white and red sections are well-handled and pretty clean looking. The expression on the final figure is slightly changed from what was shown on the proto, which was using a teeth gritted expression that looked lifted pretty straight from the animation. On the final release, he’s got this sort of side-leaning grin, which certainly looks goofier, and I suppose a bit friendlier, which was probably the main point. 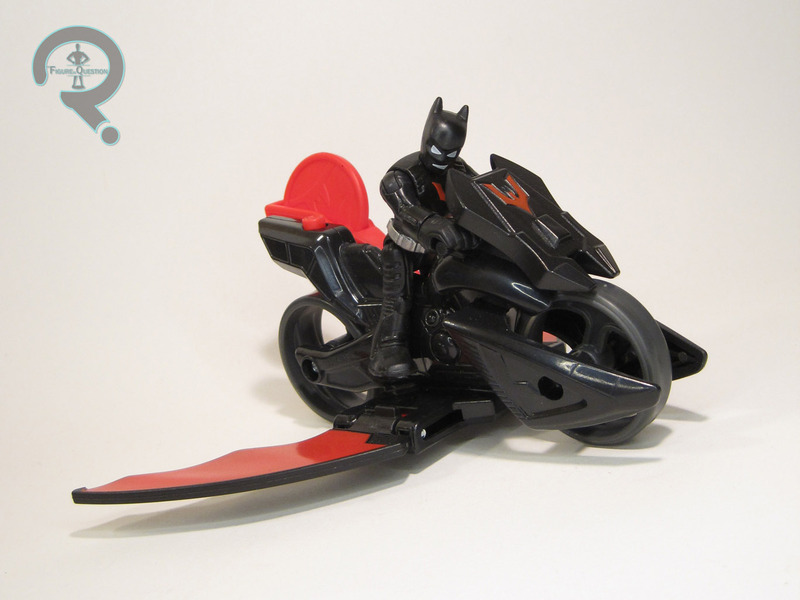 BB is packed with a bat-styled motorcycle. It seems a little more conventional in design than the vehicles from the show, but it’s not a bad design, and the choice to give him a cycle is a pretty sensible one for Terry. The wings are spring-loaded, and can be popped down by a button on the back, which is pretty fun, and, of course, there’s the aforementioned disk launching device, which, while rudimentary, certainly has its value. There are also three disks provided for it to launch. Perhaps the only thing not included that I’d have liked to see is a pair of wings, but it’s not the end of the world. Unlike a lot of my Imaginext purchases, Batman Beyond was actually not a spur of the moment pick-up. I had heard about the set from Max, and I was actually keeping my eye out for it. I ended up finding it just before Christmas, while picking up some last minute Christmas supplies at K-Mart of all places. Yeah, I’m as surprised as you. I was quite happy to find him, and, as I’d anticipated, he’s just a fun toy. 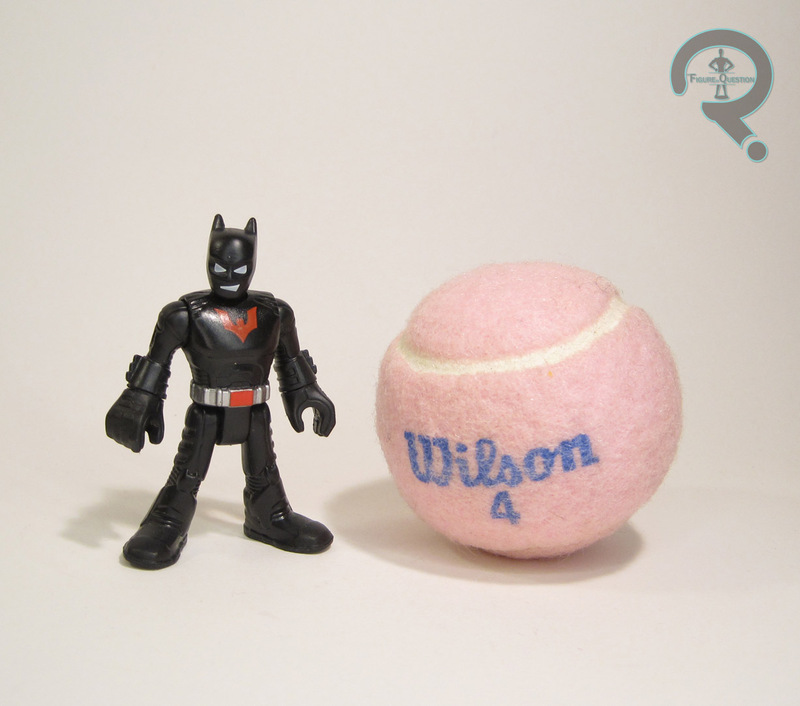 By the time Batman Beyond hit the air, Hasbro had fully absorbed Kenner and had also given up almost entirely on actually doing complete tie-in toy lines for the DC cartoons. So, their Beyond line was mostly comprised of weird variants of the title character, with only a handful of supporting players offered, and even then in very altered states. The Beyond characters largely went un-released until Mattel decided to expand the reach of their Justice League Unlimited line, and go beyond just items based on that show. It’s only fair that this expanded line would include members of the team actually *called* the Justice League Unlimited, which covers today’s figure, Micron, the team’s legacy replacement for the Atom! 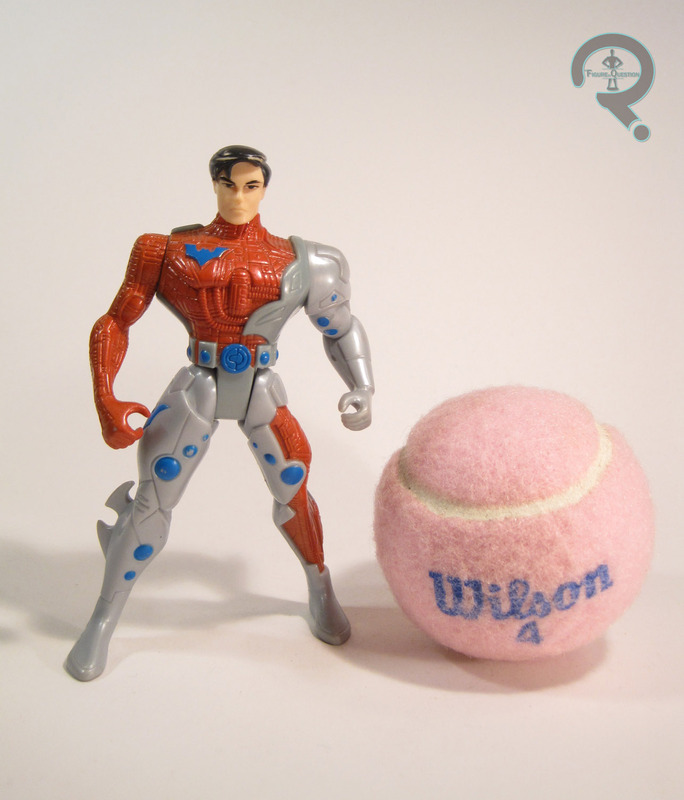 Micron was released in 2012 as part of Mattel’s Justice League Unlimited line. He was originally packed alongside his teammate Aquagirl and the future version of Static Shock. Both he and Aquagirl never actually showed up in Justice League Unlimited, but at this point, the line had more of an anthology thing going on. The figure stands about 4 1/4 inches tall and has 5 inches tall. He was built using the small male body, with a new head. While the base body was decent enough for Micron in terms of build, he definitely seems a little small. Just one of the sacrifices of doing a line based on this sort of model, I suppose. Also, as a later in the line figure, he’s got the really weak ankles that plagued a lot of these guys, meaning he falls over at the drop of a hat. It gets rather annoying. The head is a pretty nice recreation of Micron’s look from “The Call,” though it does seem a touch too big for the body. Still, not terrible. The rest of the work is all in the paint, which is pretty decent overall. The application is clean, and work on his logo is certainly sharp. The red’s a good shade, but the blue seems a little light. It’s hard to say, because in the show, the blue sections of his costume were actually black with blue highlights, so how that’s supposed to translate into an actual figure is anyone’s guess. Micron included no accessories, not even a little mini Micron, which seems like a real missed opportunity. When “The Call” aired originally, I actually missed most of part 1, meaning I missed almost the entirety of Micron’s role in the show. It wasn’t for several years that I actually got to see him in action. 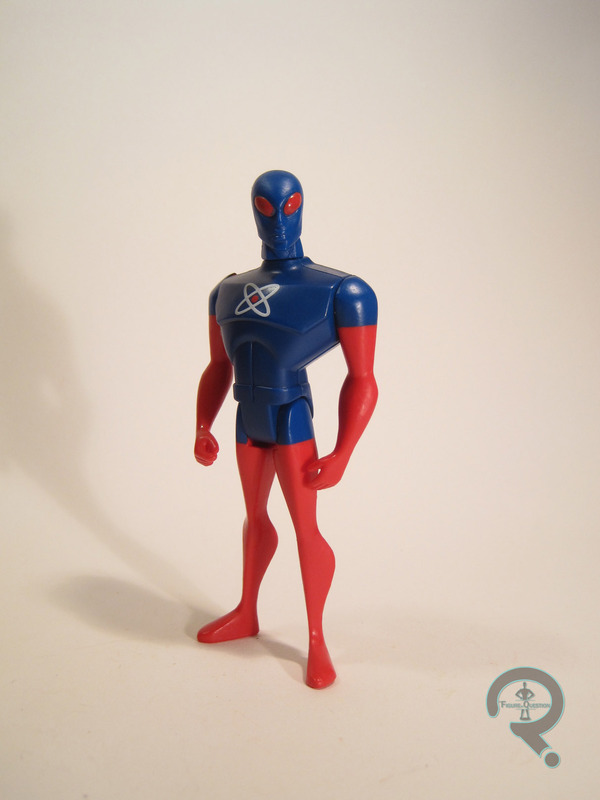 As a fan of the Atom, I was always intrigued by his design, and certainly would have gotten a figure of him when the show was still on. By the time Mattel released this guy, I had largely given up on JLU, and wasn’t really following it. I ended up getting this guy just this past summer, fished out of a bin of loose figures at Yesterday’s Fun. He’s not super thrilling, or anything, but he’s not a bad figure. Hey guys! It’s Friday, and you know what that means! It’s time for another Flashback Friday Figure Addendum! Today, I set my sites back on DC, specially Power Armor Batman from Kenner’s Batman Beyond tie-in line! Okay, officially, this wasn’t a Terry McGuinness figure. He was actually labeled “Power Armor Batman” on the box. Let’s be real here: people didn’t buy this figure because it was “Power Armor Batman,” they wanted the Terry McGuinness head. 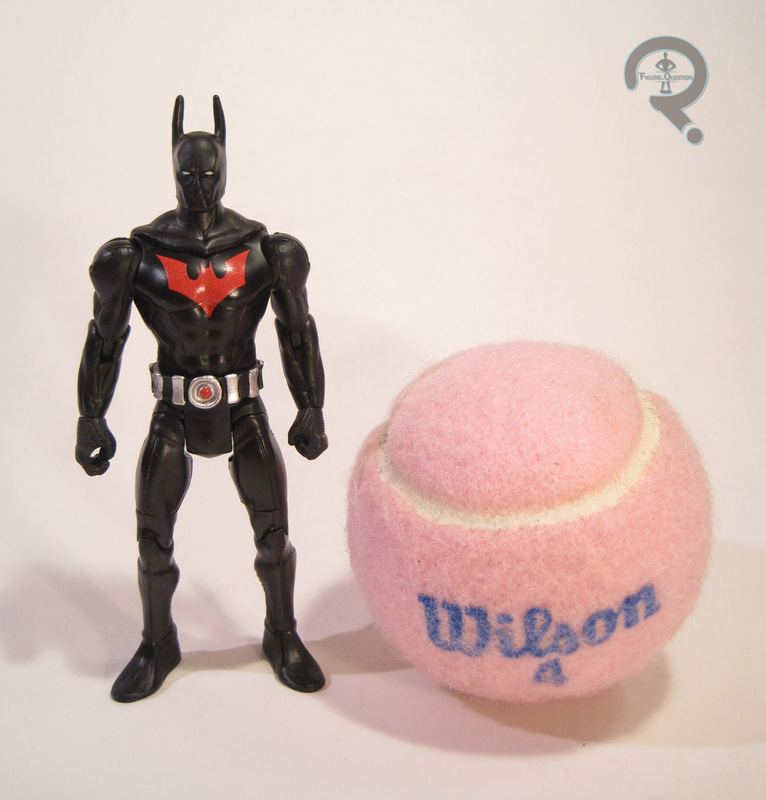 Anyway, the figure was released in one of the later assortments of the first series of Kenner’s Batman Beyond line. The figure stands a little over 5 inches tall and features 5 points of articulation. Kenner were big fans of the 5 and 5 set-up. From a purely technical standpoint, the sculpted work on the figure is pretty top notch. The circuits in his underlying suit look great, and the head is the spitting image of Terry’s appearance on the show. Stylistically, the figure’s body sculpt is completely wrong for the designs of the show, but it was in keeping with the rest of the line, so at least Kenner was consistent. The paint work is passable, with no real slop or bleed over (though mine has suffered some minor wear). For some reason, they’ve gone with a bright red and gray color scheme. Terry’s Batsuit on the show had red circuitry, so I suppose that’s what they were going for, but the light gray armor is just plain weird. 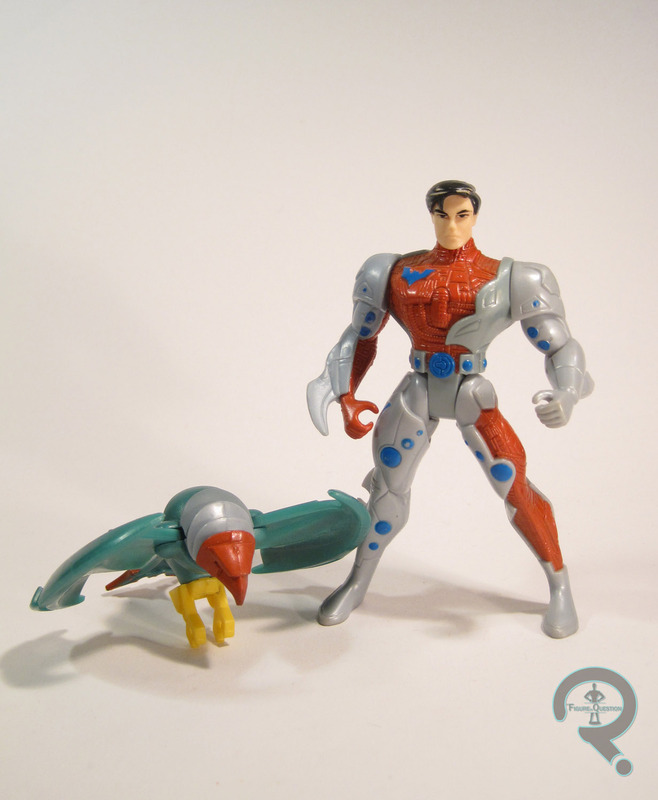 The figure was accessorized with several snap-on armor pieces, a removable helmet, and a robotic bird. It’s red, green and yellow, so maybe they were going for a Robin thing? Yep, according to the package, it’s a strike R.O.B.I.N. Okay then. Odd variants aside, I was very excited for the Batman Beyond line at the time of its release. I actually recall seeing this figure at the store several months before I actually got one. I saw the figure on a trip to the store with my parents, who told me I’d have to get it some other time. Little did they know that it would end up being one of the harder to find figures in the line. So, months went by, and I just assumed I’d missed my chance at the figure. Then, on another routine trip to the store, I wandered to the toy aisle, where I found this figure, as well as Blight. My parents were more than happy to get them for me this time around. As strange as this line was, I still have a major soft spot for those two figures in particular. Plus, they actually are pretty good toys! This review was after I’d passed 200, so for all intents and purposes it’s effectively a modern review. It remains the only figure I’ve looked at from this line, a whole 1000 reviews later, which means I’ve yet to get a chance to really touch on how odd this toyline was. I mean, this guy was actually one of the more faithful figures, and he’s still really off. Maybe Kenner was wanting to keep these figures consistent with Total Justice and JLA? It’s odd, because they were still running the TNBA line at this point, so you’d think they’d have wanted the two lines to be compatible, right? I don’t know. During The Find, I uncovered that damned R.O.B.I.N. sidekick animal thing. It makes about as much sense as the rest of the line, I suppose. I also found one piece of the clip-on armor, but sadly the rest of it’s still missing. Maybe it’ll turn up one day! At least it was the other arm piece, so he looks a little more symmetrical now. Oh, and there’s another piece of the Me Half of the Equation that I left out initially. I noted that I found Blight at the same time as this figure, after looking for both of them for several months? Well, I actually found Blight first, and eagerly ran back to my parents with him in tow. When I showed him to them, they, in their wisdom that is far beyond mine, suggested that this guy might be there too. So, I went back to the aisle, and, sure enough, someone had cleverly hidden him behind the other, goofier Batman variants. This figure still makes me pretty happy, truth be told, as goofy as he may be! Uh oh. It’s a Mattel figure. This can’t be good. Okay, that’s not entirely true or fair. Mattel figures have the potential to be good, or even on the rare occasion great. In fact, most are at least passable, but some aren’t. And also, I don’t like Mattel as a company, for a whole slew of reasons, chief among them being that a whole lot of their products just feel so lazy. In fact, in the last year, I believe I’ve bought a whole four Mattel figures, mostly due to the vast majority of their output being rather dull. One of those four figures is today’s entry, Batman Beyond. Let’s see how he turned out. 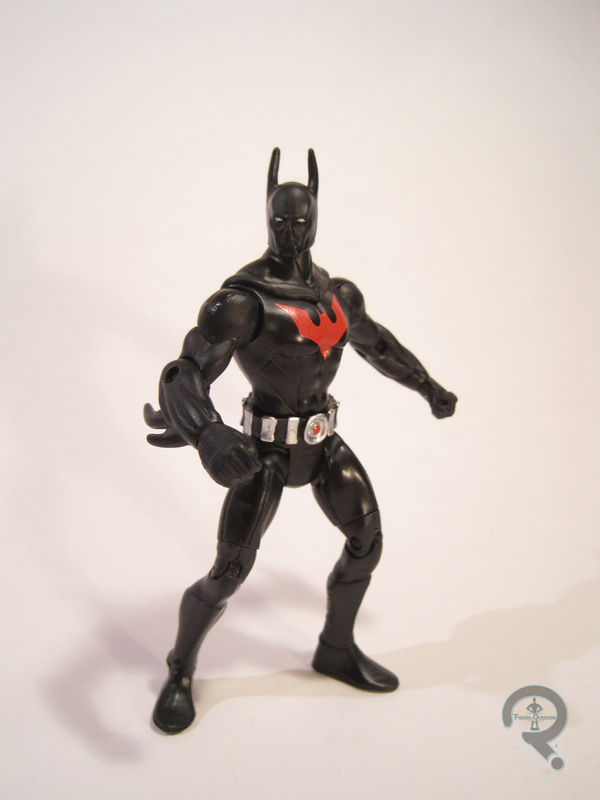 Batman Beyond is part of Mattel’s DC Comics Multiverse line. The line doesn’t really have traditional series to speak of, but BB was released in the last year of the line. He’s part of the Arkham City sub-set, and is based on one of the alt looks for Batman from the game, rather than being an actual Terry McGuinness Batman Beyond. The figure stands 3 ¾ inches tall and has 18 points of articulation. The layout of the articulation is the same as both the Christopher Reeve Superman and Arkham Knight Robin figures. It’s not the worst articulation ever, but it could really, really use some sort of upper arm swivel and a mid-torso joint. The current layout leaves him a little stiff looking. In general, the sculpt of this figure feels pretty stiff and somewhat oddly proportioned. Some of that, such as the small head and larger hands, are at least partly present in the game design, but some of it’s just weird sculpting. Like Robin and Superman before him, the figure’s waist just sits too low, which looks really odd. Also, it looks like BB’s got at least a few parts in common with several of the previous Batmen. Because of this, he still has the usual Batman boots, which aren’t accurate to the design, as well as a weird shoulder piece that looks like it should have a cape or something attached, but it doesn’t, which is reasonable, since BB’s not supposed to have a cape anyway. Since one of the draws of Batman Beyond is his sleek design, these issues with the re-used pieces jump out a lot more than they would otherwise. BB does get his own head, belt, and forearms, which all do a pretty great job of capturing those parts of his design, and blend pretty decently with the rest of the sculpt. BB’s paint is one of his stronger suits. Everything is pretty cleanly handled, and his emblem in particular is nice and crisp, and really stands out well from the rest of the figure. BB has no accessories, which isn’t out of the ordinary for a Multiverse figure, but remains annoying given the price of the figure and the fact that he re-uses quite a few pieces. Remember how I was done with DC Comics Multiverse? Yeah, that seems increasingly incorrect. When I was down in North Carolina visiting family, I ended up finding this guy on a grocery run. I’ve always had a soft spot for the Batman Beyond design, and Super Awesome Girlfriend was there with me, so there really wasn’t a chance I was saying no to this one. He’s a flawed figure to be sure, and definitely reminds me of why I don’t really do Mattel figures anymore, but he’s Batman Beyond, which does a lot to outweigh some of the cons. *While doing some research on this figure, I discovered that Kenner did a repaint of this figure in more appropriate colors for their Deluxe line. He was dubbed “Strikecycle Batman,” if you’re curious.